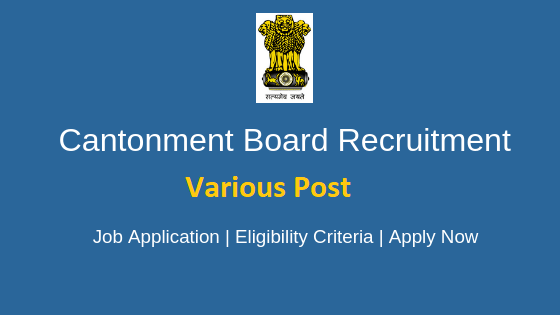 Cantonment Board Dalhousie Recruitment 2019: A new notification is out; it is issued by the ‘Cantonment Board Dalhousie’ for Peon, Ayah, Forest Guard & various other posts. As per the guidelines of the notification, the online application of the ‘Cantonment Board Dalhousie’ will run from 18th Mar 2019 to 11th May 2019 for overall 16 vacancies. So, it’s a grand invitation for all the eligible & interested candidates belongs to Indian citizenship and are looking to apply for the Cantonment Board Dalhousie Various Vacancies Recruitment 2019. In Junior Clerk: Need to have a passing 10+2 qualification or its equivalent from a recognized University or the Board of School Education. In Bhisty: Is needed to have a middle 8th standard passing degree. In Mazdoor: Must have a middle 8th pass degree. In JBT (Junior Basic Teacher): Is required to have a 10+2 (or it’s equivalent) with minimum 50 % marks and 2 years Junior Basic Teacher qualification (JBT) Or Diploma in Elementary Education (D.EI.Ed.) from a recognized Institute of any state Board of School Education according to the NCTEs (Recognition Norms & Procedure) Regulations, 2002. 10+2 (or it’s equivalent) with minimum 50 % marks along with 4 years Bachelor of Elementary Education (B.EI.Ed.). Payment for the recruitment examination shall be made through Debit card, Credit Card & Net Banking. Reasoning & General Intelligence of both verbal & non-verbal reasoning based. The General Awareness paper will be Geography, History, General Polity, Economic Scene, Culture, Indian Constitution & Current Affairs based. English Comprehension will be based on candidates’ English understanding ability, Basic English Comprehension, & Writing Ability, etc. In ‘Forest & Forestry’ candidates’ knowledge will be tested with ecological & forestry concepts. In Child development test & pedagogy the focus will be on the educational psychology & on learning which is relevant to the age group of 6 to 11 years. Step-1: Eligible candidates are needed to visit and open the Cantonment Board Dalhousie’s website through the direct link is given below to apply before the last date of 11 May 2019. Step-2: For applying online, candidates are required to have valid email ID & scanned copies of the passport size images, & signature. Step-4: Then, on the home page, click on the “Click here for New Registration”, in case you are a new user. Step-5: Here, complete the full Registration & press the “Submit” button. Step-6: For Registration, Log in with valid Registered Number & Password. Step-7: Then, start filing all the details in the application & uploading Photo & Signature. Step-8: After completing every relevant detail of the application, on the next page application fee have to pay through online above-mentioned modes & then have to submit the entire form. Step-9: Finally before submitting the application has to take a print out of online application and to keep it safe for the future use.